With amber and red weather warnings for the severe weather in most of the country we are asking people to act quickly to protect their outdoor pet rabbits. 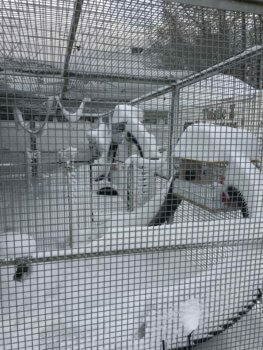 Our normal winter advice doesn’t cover these extreme conditions so we would ask owners to bring their rabbits into unused garages or sheds. Or if that is not possible then bring them indoors. But please be aware that if you are bringing them into the house, keep the room unheated. Rabbits are extremely sensitive to changes in temperature so if you put them in a room that is heated, it will be dangerous to put them outside in the cold again. If you can’t bring them into a garage, shed or into the house then follow our winter advice, but multiply it by 10. Rabbits really do suffer in these conditions – in the wild they’ll stay underground in large groups sharing body warmth. Pet rabbits rarely have that luxury. Keep them warm and dry, keep them safe.